What Is 20 Cogs? A Scam, Or Easy Money? Last updated on January 12, 2019 By Nat 2 Comments This post may contain affiliate links. We appreciate you supporting Rags To Niches! Full disclosure here. 20 COGS Review: A Scam? Or Legit, Easy Cash Online? I came across 20COGS on, to my surprise, Pinterest. I’ve noticed a steady incline in businesses using Pinterest to grow their business and this is something I’ve been looking into as well, as I mentioned over at this post. Anyway, it was one I had not seen before and since it’s exactly the sort of website I look into. So, I went along to have a look and see what it was all about. To do that, I signed up myself. 20cogs is not exactly what I originally thought. They mention from the get-go that you earn money via completing offers, surveys, competitions and playing games. So, I presumed all these things were on the platform. (some of those offers may include lotto draws/casino offers/surveys/trials/memberships and so on). Each offer you complete, is worth a certain amount of money. When you have completed 20 offers, you can cash out a lump sum of money. So, could you potentially walk away with several hundred pounds from 20COGS, for minimum effort? Or is this just a scam? Well, as of right now, 20COGS is definitely paying their members and seem to be doing a good job keeping on top of any problems people have on the platform so far. Check it out here – free sign up. That being said, there are still some things you should keep in mind when you sign up, which I will cover during this review. 20cogs does a good job of explaining themselves in their introductory video, which gives you a good idea what they’re about. One thing I liked, is that they’re transparent about where their money is coming from and how the whole system works. The core of 20Cogs revolves around paid-to-do offers. Joining another website as a member… things of this nature! Sometimes the offers will be free and other times, you may have to pay a certain amount to release the offer, (such as make a deposit at a casino, or pay £1 for a trial). For every offer you complete, 20 cogs receive a commission from the advertiser, they then share a proportion of this with you. Lots of sites online have a paid offers section; including big sites like Swagbucks. Where 20Cogs differs is that you need to work through one offer at a time. You can’t just pay out after an offer or two. So, for example; at cog 1 you will be given a choice of offers and you will need to accept one of those in order to move on to the next stage. They also have a way of tracking that your offer has gone through correctly. When you check back, your cogs will begin to change colour depending on what stage your offer is at, (this initial change could take 24 hours). So, when it is amber, it means that the offer has been tracked by the advertiser. When your cog goes green, it means the offer has been completely tracked and you can then move on to the next offer. You can take as long as you want to go through the offers and your earnings will grow as you do. When you sign up, 20Cogs give you your first £1 as a welcome bonus to get you started and you can then check out the first offer. For me, the trial on offer was a one month trial by WHICH? for £12.50. What I liked was that the instructions were very clearly set out in steps, (this isn’t always the case with pay-to-do offers). Another thing I noticed was the cost, this seemed like a high amount to me to join a free trial – in comparison to some other sites providing offers. What you must remember in the case of free trials though, is that you need to see them through. This can be a grey area, because you may need to cancel a membership prior to a free trial ending, or you could end up paying for another month. 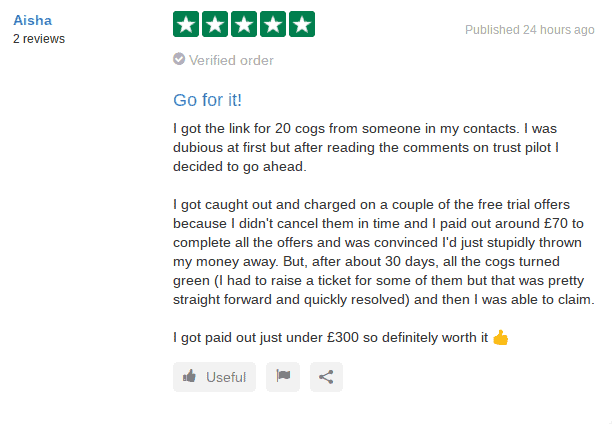 You may want to double check with 20Cogs when exactly you can cancel your free trial to avoid being charged – this may vary depending on the advertiser offer. While you don’t have the ability to check every offer available at each cog, you can check out a selection. When I clicked “Alternate Offer…” at COG 1, I was given the option of five offers in total that showed up. – to join playlottery.com for £1 and earn £15, (you only need to stay a member for 48hours with this one, so this looks like a good deal). – sign up to a 30 day trial with Audible for £7.50. Less money than the other two but still a reasonable amount for a free trial. The offers available are going to change, depending on when you sign up and what 20Cogs have available at that time. When Can You Cash Out? This could be considered either a PRO or a CON, depending how you look at it…. But you have to complete all 20 cogs/offers (and have them accepted) in order to actually cash out. Now, with many other sites that include offers – you just need to reach their payout threshold and you can withdraw your earnings at any time. So, you may only need to complete one offer to reach that payout. Is I can imagine that once you’re nearly at your 20Cogs, something could go wrong with one of the previous offers and it will go back to amber. Maybe you are unable to complete one of the other offers available and then you’re stuck, not being paid. Maybe you just get fed up with the whole thing before you finish all 20 cogs… then you get zero money at all. (I can imagine this happens to a lot of people). it means you will be paid out a nice lump sum of money when you complete all 20 cogs and this is a decent amount that could actually make a difference to you. Surely, it’s better to be paid out £300, than just £10 you get from a single offer? Although, you are able to save up your money on other platforms as well, (which is what I do on some platforms). That being said, the offers they’re providing do seem to be for a decent sum and it’s surely an incentive to see it through. The only issue is the potential that something could go wrong during those link of cogs. From what I can see though, site support do try and help you resolve issues. In my experience however, trying to get support can be slow and quite frustrating. I really don’t like how the support system works right now – you should just be able to email a support team. Instead, you have to first go through an FAQ section to try and resolve your issue there and the whole system just feels clumsy and frustrating! There is a referral program at 20Cogs, which means you can earn 5% of whatever your referrals earn. 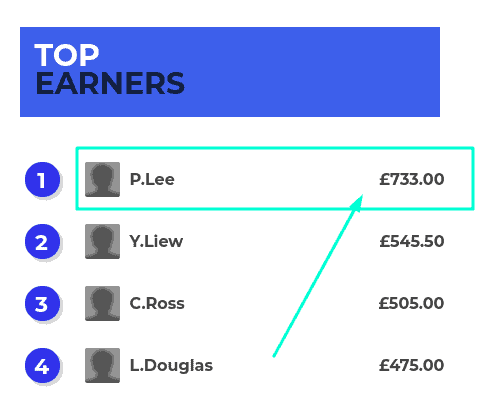 So, for example; if you email your referral link to your friends and family, or via social media and some sign up, you will earn 5% of what they earn, plus an additional £20 if they complete all their 20 Cogs. 5% s is on the low side as far as affiliate programs go, but the £20 would be a nice perk if your referral completes all their offers. Related Post: My Top 10 UK Survey Sites! As some people have mentioned online, you can get spammed when you compete paid-to-do offers and are giving out your personal info. To avoid this as much as possible, I would consider setting up a separate email address and even using a separate phone number if you have one. (e.g. I got a cheap £10 pay-as-you-go phone to use when entering competitions online, which can lead to spam calls sometimes). There are a large number of positive reviews online for 20COGS at the time of writing. Actually, I was quite surprised by the large amount of positive feedback for this sort of opportunity. I think this is partly due to 20COGS being really clear with their instructions about exactly what you need to do. Because their instructions are clear, there is less room for mistakes and you know exactly what to expect – and there is no exaggeration or deception about what you can potentially earn. Plus, they seem to really make the effort to resolve their members problems. The layout of their website is appealing and clean, it’s simple to navigate and understand. I also think, that so often with offers, people end up disappointed because – just the odd one here and there will not amount to much. Whereas, as there is 20COGS here, it gives you an incentive to complete the offers and actually end up with a really decent sum of money by the end. I guess it makes it more of a challenge as well, people want to see all of those COGS turn green! People do seem to say that sometimes the odd thing will go wrong with an offer, but I’ve seen that the support team do their best to resolve any problems. Do you have any feedback about 20cogs? Leave a comment below! It’s worth taking the time to do screenshots have proof of purchase, in case anything should go wrong. Keep all records of sign ups – all the dates of any trials you sign up to and any payment details. – At the time of writing, they have a good reputation. There are many happy members who have been paid and when there has been a problem, 20cogs have been on top of it. – You can easily cash out via PAYPAL, which is fuss free. Or alternatively, BACS. – Having the 20COGS to complete will give people more incentive to complete the offers, because you will have a decent pay out at the end. I do think this is both a PRO and a CON though, as I feel many people may end up leaving prior to finishing and then not ever receiving a payment. – 20COGS have a dedicated team checking out and responding to reviews online. Where people have had a problem, there seems to have been a valid reason for this and they have been able to resolve it. – If you complete all the cogs, you have a good chance of being able to withdraw several hundred pounds. Which is decent for a small amount of work! – By having to complete all 20 offers, this could mean that some people will give up prior to withdrawing any money. -It’s not clear what all the Offers will be beforehand. This means there is a risk there will be a COG that you simply can’t get by. Whether it’s because you have already completed the offer in the past, or because you simply don’t want to sign up for it. – When you get started, you don’t know what sort of offers lay ahead. So, say you get halfway and then suddenly no offers are interesting to you. You then have just wasted your time and won’t get paid. – As mentioned previously, you can get spammed when compeleting offers, including via phone. – You may have to wait 30 days in some cases for your offer to be confirmed. – It can take a really long time and can be frustrating waiting for offers to turn green. – Their whole support system is messy in my opinion, I found it frustrating. – Always the case with completing offers: but you normally will have to provide your credit card details. – There will be gambling/casino offers there, which may not be of interest to some people. Also, if you already do matched betting online, you may have already previously signed with many bookmakers/casinos online already. How Much Can You Make With 20COGS? 20Cogs have a section on their website where you can see how much people have made either this month, or all time. At the time of writing, the most someone has made with 20COGS is just over £700. However, many people seem to have made between £200-£300 for completing the 20Cogs. Of course, the higher paying offers you go for, the more you will earn. Conclusion: Is 20COGS worth it? If you’re in need of a few hundred pounds in a few months time or so…. Maybe to pay for a birthday, or a big night out; then this is a feasible option that pretty much anyone could do. In addition, if you have any friends or family that you think would be interested; you could make a bit extra if they sign up. Click here to join – and claim a £1 bonus. However, if you’re looking for a way to make a more of a regular income online, or even a full-time income online, then read on to the next section. Making Money Online – In The Long Term! If you’re looking to make either a part time income, or even full time income online – doing paid offers isn’t the way to get there. For a large variety of ways to make money online – check out my 40+ ways to make money online. While there are various ways that you can make money online; one way that I make money online is from having a blog and partly, from Affiliate Marketing. Affiliate marketing is great because, you don’t have to deal with customer service, physical products, transactions or shipping. You’re just the middleman collecting the money at the end of the process. Another great thing about it, is you can create a business surrounding topics that you’re really interested in. Many people online, still don’t understand the process of affiliate marketing, despite it being used by a majority of businesses online these days. Just think of any well-known brand around today – a majority of them will have an affiliate program. One of the most famous, being AMAZON. Which boasts one of the biggest and most popular affiliate programs online. In fact, I made my first affiliate sales online with the Amazon affiliate program myself! If you’re interested in learning about affiliate marketing, I recommend the free training here. There you will find a free step-by-step course that will explain exactly how it all works – it also boasts a large online community. If you have any questions, or you’d like to share your experience of 20COGS – let me know in the comments! How to make money from a simple website/blog. My Top UK Survey Websites. 14 Ways To Make Cash With WordPress. Filed Under: cashback & Offers, positive reviews Tagged With: 20Cogs Review, Is 20Cogs A Con?, Is 20Cogs Legit? Very interesting article. I’ve not heard of that particular company. When I first saw that it was surveys and such, I almost quit reading. I’ve gone that route & the payouts are very low plus I didn’t qualify for many of the surveys (SwagBucks). But I kept reading and see how good the reviews are and see in your comments that others have tried it with success. I might just sign up for it through your link! (Like I have time to do more stuff. LOL). It is available for U.S. folks? Hey Lisa – I know the payouts are so low and it’s.v. annoying qualifying for surveys. With swagbucks, I just use them for cash offers and searching the web mainly. Anyway, I’m afraid to say that 20cogs is currently UK only! I wonder if they have a US version coming up… it’s possible! Thanks for stopping by anyway :).